NEW DELHI (AP) — Indian officials have traveled repeatedly in recent days near the remote island where an American missionary was killed by people who have long resisted the outside world. 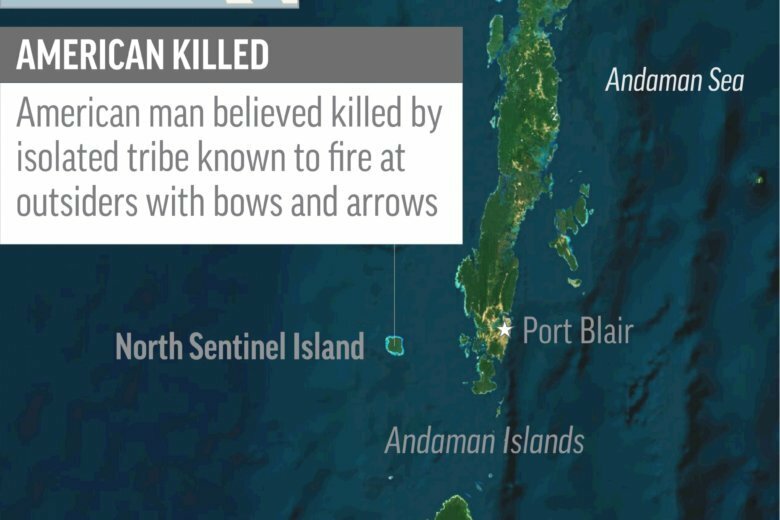 But they have not set foot onto North Sentinel Island since the killing, and it remains unclear if they will. The Sentinelese, who scholars believe are descendants of Africans who migrated to the area about 50,000 years ago, survive on the small, forested island by hunting, fishing and gathering wild plants. Almost nothing is known of their lives, except that they attack outsiders with spears or bows and arrows. American John Allen Chau was killed by islanders in mid-November after paying fishermen to smuggle him to the island, where outsiders are effectively forbidden by Indian law. The fishermen told authorities that they saw the Sentinelese bury Chau’s body on the beach. The notes Chau left behind say he wanted to bring Christianity to the islanders. A boat carrying police and other officials approached North Sentinel on Friday and Saturday, watching the Sentinelese through binoculars. On Saturday the tribesmen were armed with spears and bows and arrows, but they did not attempt to shoot them at the authorities, Pathak said. “We watched them from a distance and they watched us from a distance,” he said. Officials have not given up on recovering the body, he said. But they are moving very gingerly, studying the 2006 killing of fishermen whose boat had drifted onto the island. The islanders buried the two fishermen on the beach in 2006, but dug up the corpses after a few days and propped them upright. Authorities apparently never recovered those bodies, and the killings were never investigated. Anthropologist P.C. Joshi said he understands why authorities want to recover the body. “If there is a death, then the cause of death should be known. It’s important,” said Joshi, a professor at Delhi University. “Of course, we can’t prosecute” the islanders if they killed Chau, he said. Plus, he noted, it may already be too late to learn much from the body, since the heat and humidity on North Sentinel will cause rapid decomposition. “Ultimately, it’s becoming futile,” he said.